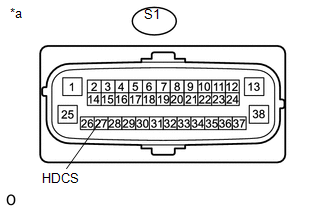 The skid control ECU (brake actuator assembly) detects an L4 detection switch (Transfer shift actuator assembly) open circuit. The skid control ECU (brake actuator assembly) receives an L4 abnormal status signal from the HDCS terminal. (a) Inspect the transfer shift actuator assembly (See page ). 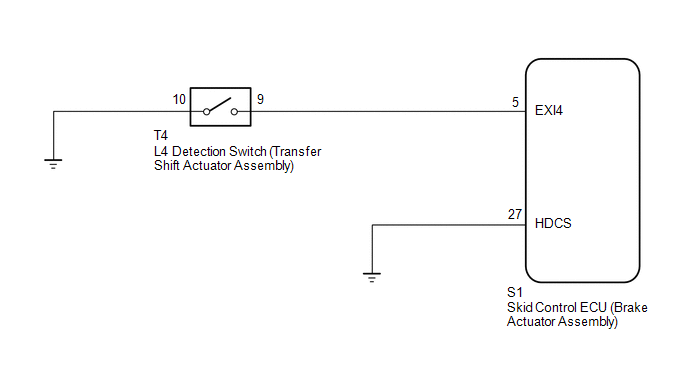 The transfer shift actuator assembly is normal. (b) Disconnect the T4 L4 detection switch (Transfer shift actuator assembly) connector. (b) Check if the same DTC is recorded (See page ).